Aquarius represents liberation and individuation. If this energy is emphasized in your chart, you may feel like you can’t be in a long-term relationship. 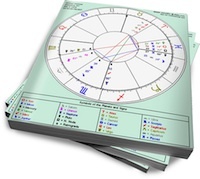 Although some Aquarian-types have no desire to be in a committed partnership, there are others who would love to meet someone who understands their unique needs. Just because you’re independent doesn’t mean you don’t want companionship. I’m super glad you did an article on this. I’m an Aquarius moon, with Aquarius on the 7th, and Mars square Uranus. Plus I have 3 planets in Sag to boot. Lol. Talk about the need for freedom within structure. I get every word of this article. Being aware of the Shadow is crucial. Before astrology came into my life I used to think that I was doomed to conform to conventional relationships or be alone. Both frightened me. And I was pulling in unsatifying relationships as a result. Working with my Shadow has helped to to get past that. Recently, my moon has progressed into Gemini and it’s only pumped up my need for freedom. However, I’m realizing the key for me is accountability/responsibility. It’s one thing to be unconventional. It’s another thing to be reckless. Great article. I’ve been noticing a lot of aquarius around me, so this is timely. Do transits and progressions count? Venus is currently progressed in aquarius 5deg in the 4th house. My natal uranus is in virgo 18deg 12H, conjunct with pluto. Transiting uranus is conjuct my DC which is 7 deg Aries. I am libra rising and scorpio sun, and I have always found I attract aquarians. Or that saturn energy. One of my friends is extremely saturn right now, he’s capricorn sun, and his progressed sun is in aquarius, conjunct his progressed mercury and mars. He’s very withdrawn right now and being hard on himself. It’s tough to see someone go through this, but you sort of have to let them work through it, and just be there. I would like to understand aquarius better as I have attracted the energy my whole life. Thanks, Nadia! I have natal Uranus at 0 Libra, out-of-sign conjunct to late Virgo Ascendant…plus IC in Sag…and a lot of your points here resonate strongly for me, even without planets in Sag or Aqua. Food for thought here — thanks! Its the conflict that it brings up. I’m Uranus rising, with Venus and Mars in aspect to Uranus, and Aquarius on the 7th cusp. Never been married. However, My chart is dominant water, with a Cancer Moon. How does once reconcile this need to merge, and need not to ?! Hi Nadia, I feel I am a family case study. After her divorce in her fifties, she knew a man and then followed him near the seaside but took a flat apart from him. I think they call by phone each other almost 5 times a day. Although she’s nearly 80, she shares her time with him only on week-end. She comes back home every Sunday evenings. 2/my sister has Mars square Uranus. She’s living with the same man for 15 years but in different houses. They’ve just bought an old house to do up last year and they will live together!!! But before that, my sister rebuilds a garage to make flat where she would spend time alone. I’ve never really living alone for a long time because I shared my flat with roommates and share myself between my home and my lover’s home BUT I’d been experiencing pain from that situation because it wasn’t my choice or our choice but their choice. In a way my lovers were worse than me (all with sun-uranus contacts). I felt the situation as unclear and not reassuring, perhaps because of Scorpio on the cusp of 7house and Neptune in 7house also. I probably wanted a “more normal” couple life even I always recognized my need for autonomy. Now I’am living alone and my prospect lover (another Sun-Uranus man but with a lot of Saturn between us) is about to move in another city. If it works between us I feel that the life of “sailor wife” would be perfect for me. As Pluto is about to make a sextile to my venus and his progressed venus, I am full of faith! HI again 🙂 Just looked at the aspects that do appear on generated charts, and I see I have natal uranus square venus and mars which are conjunct in Sag 3H. Uranus is also directly opposite my saturn in pisces 5H. Then on my friend’s chart, his uranus in scorpio 12H conjunct his AC is directly opposite his moon in Taurus, 6H conjunct his DC. Between us, in synastry and composite charts, there’s a lot of uranus and saturn, some good supportive aspects, but also some of these hard aspects. My uranus hits his MC, apparently I electrify his whole chart? This is very interesting, I never thought of myself as so Aquarian! I just thought with all that Sag, that’s was me. I never really considered my more ‘serious’ side beyond my sun scorpio! I’ve always known I needed time alone, to rest and recharge, so I understand this in others. It’s true, I need to be close and I need to be free. I see my friend does too. And friendship does matter most between us, from the look of things. It does feel like there’s more under the surface, but it’s unknown for now. Also, those times we’re sweet towards each other are always followed by some detachment. I thought it was really weird at first! There’s this sort of ebb and flow. I’ve learnt to trust it now. I have Aqua in the 1st house/ Leo in 7th…. Aqua/Leo North Node-South Node…. Venus in Sag in the 11th house conjunct Uranus in Capri in the 11th. So this article definitely touches my soul and spirit when it comes to love. For years, I wondered why I kept aligning myself in relationships where in the end, I was unsatisfied and felt depleted. I was trying to fit into a societal norm that did not fit my soul’s purpose. And astrology has DEFINITELY helped me deal with this. As I get older, I understand why I don’t mind being single and I love alone time. But I also understand that I have to make my own love/relationship manual… This article definitely helps me understand this more. But before settling down, there is a little more floating around that I must do. LOL. I can’t help it. Another great article! Like so many other readers here, I constantly struggle between a need for closeness/partnership and a need for independence. Although I do not have any personal planets in Aquarius (only my NN) I can really relate to this article. I also need a lot of autonomy in relationships and feel easily caged in. Maybe it is because of my 11th house Venus/Mars or my Sun, Moon and Mercury in Aries. I think Aries is as much independent as Aquarius, isn’t it. Is there much difference? I also insisted on my own “extra” room for retreat when I moved to my boyfriend’s house (guess that is my Uranus in 4th house). Luckily, he is ok with that with his 1st house Uranus. It is said that 1st house Uranus Types need lots of autonomy/freedom. But what if Uranus conjuncts a Scorpio Asc? Scorpio wants merging and Uranus detachment. So how will that play out? Will the energies be balanced then? I always struggle with interpretation if very different energies come together so I will be grateful for your suggestion ? Wow, that’s a lot of Aquarius! Thanks for sharing, and for letting others know how you’ve been handling it. Progressions count. You may not feel the Aquarian energy as directly, but it’s definitely part of your life. TR Uranus on your DC will emphasize whatever potential to rebel the sign on the cusp already has (in your case, Aries). Find a partner with similar/complimentary energy. Someone who is totally there for you in the moment, but also has a life outside the relationship so they can go away and give you your space (but they keep coming back). Yes, the separate residences or physically distant relationship is a good choice for many Aquarians. Excellent point about the ebb and flow; Uranus is not a steady energy, but when it switches off (as it usually does) that doesn’t mean it won’t switch back on. …also, thanks for sharing the information from your family. Astrological signatures tend to run in families, and it’s always an interesting study. I have Aq on the 7th house cusp, sun/n node sq Uranus (conj Saturn) from the 1st to the 10th. Interestingly this resembles my mother’s signature but reversed, as she was an Aq sun w/ Uranus/Saturn conjunct in the 4th house. It is not simply personal freedom within a relationship IMHO but also the ability to perceive the future and innovate, and the necessary tolerance, vision or simply love by the partner to accept this. In sum, the Aquarian needs a partner with a capacity for largesse, be it emotional, intellectual, or practical. No small minds need apply. It’s important (whether you’re single or not) to become comfortable with and even love the energy in your chart, since that’s what you’ve been given to work with. One thing about that Scorpio DC…check the position of Pluto (your DC ruler) in your chart. That will give you more info (and possible solutions). Scorpio/Pluto is about evolution, so I think part of the deal is you need a partner/relationship who is on board with the whole transformation thing (as in, not stagnating). Yes, Aries can be just as independent as Aquarius. The difference is that Aries starts and stops things much more quickly (it’s a Cardinal sign). It’s more changeable than Aquarius and certainly not detached. If Uranus conjuncts the Scorpio AC, I would say the outcome is the need for merging on your own terms. You’re ready to get close, but only when you’re ready, and not one second before or after. But as for which energy will dominate, that depend son the individual. I would look to the rest of the chart and see which planet is more emphasized (Pluto or Uranus). Thanks, Nadia 🙂 Good point about pluto. I was going to mention how that appears a lot in my friend’s chart, and in our synastry charts too. In fact, he has Pluto exactly conjunct his MC. He’s all about change and transformation. But that uranus energy makes him erratic and fickle. My Pluto is conjunct Uranus in 12H. One degree apart. I’m a secret rebel? I keep writing about my friend because I am completely baffled. I’d like to make sense of things and have some idea of what’s happening and what’s ahead. But I am completely lost! I just know I seem to be in this for the long haul, there are some binding saturn aspects, and his sun is in my 4H. In composite chart, moon is in the 4H. Feels like there’s a reason we met, like fate had a hand, and it’s for us both to grow and learn. My husband is possessive and nurturing and very romantic, we are mutually clingy… I just got a new job and he hates that I work in the office of a transportation company where men are in and out of the office all day, Why on earth would a Libra cheat or even imaging cheating on a guy like my husband? He is wonderful and I love him so much He says he isn’t worried that I’d cheat he doesn’t trust the other guys ???? What does he think that some big gorilla of a man is going to stuff me in a burlap sack and run away with me? LOL The guy I was going out with before was the same. Some people really need to get a grip. I forgot, if any Libra women are reading this, you should know if you don’t already, once one of these Aqua guys touches your heart, you won’t want anyone else…… If you meet an Aquarius man and he seems interested, don’t give it a second thought, when they love it is huge, if you can be lucky enough that an Aquarius loves you, your life will be full of laughter and harmony. They are fantastic husbands as long as you love aliens. Always remind him that you don’t feel that you own him and he will try to make you want to. LOL but be warned they are as possessive as a Scorpio once they hold you……. Thanks for the insight Nadia! My Pluto is in the 6th and conjunct my Sun. All my relationships have had a Pluto/Uranus flavor: highly transformative, highly erratic. Thanks for this article Nadia maybe you can help with this: My asc/1st Leo and dsc/7th Aqu. Saturn in Scorpio (4th) Uranus in Sag (5th). I should then be looking for partners who are intellectual via seeing how I express my intellect and creativity? Also my Venus is in Taurus 10th h (opp my Saturn) so I feel this puts a very serious spin on relationships for me. Thoughts? Impulsive and blunt, but not necessarily fickle. Uranus in Aries (on the DC) craves freedom and absolute honesty in relationships. The DC is your projected energy, so with Uranus in the 5th (house of self-expression) work on expressing your personal freedom/desires as honestly as possible, and that should help attract a partner who is good for you. Venus opposite Saturn will put a serious spin on relationships, so you should look at what you feel you deserve regarding someone who supports your self-expression. Venus opposite Saturn can undermine self-esteem, or end up settling for less. You’ll attract who you feel you deserve. Thanks for sharing. Good point about Juno in Aquarius…these people need a partnership alongside their life, as opposed to a partnership that is their life. Nadia, once again, you are bang on. Sun-Uranus conjunction in Libra 2H. Yes, I value my independence and space. The stubborness I attributed to Taurean Mars, but that is retro and I have 7H Pisces Moon. Cardinal + Fixed.= Insufferble Stubborness. Thank you for pointing that out. my ex boyfriend has moon in scorpio conjuction uranus in 4th house. He has 7th house in aquarius. I really don’t know what does he want? Sometimes he is so possesive and jelauous! And other time he is so afraid of closness. How would you interpret MOON in scorpion conjuction uranus…what kind of women thoce he want? How could I approach him? I am really confused with those mixed energies in him. That scorpio and uranus…it is really confusing. A so, that you answer to someone,that he wants merginig with other person, but when he wants?? Does my venus square uranus nad mercury trine uranus…is enough uranus energy for his moon conj uranus and 7th cups aquarius? This an article written especially for women to shine more light on experience with Taurus male. May be it will help you to understand. A lot of females are also sharing their experiences with Taurus male in the comments sector. but in love relationships and his choose of women, and emotional life it is more important to look at his Moon, Venus and /th house. As I said, he has Moon In SCO conjuction Uranus -> and that is the most confusing part of him to me. Scorpio is really deep, want you soul, deep connection with partner ( I know because I have it too), but their is Uranus conjuction to his moon…what is completly different energy. Moon in Scorpio conjunct Uranus means he needs intimacy on his own terms. And there will probably be an on/off quality to his intimacy, but he still needs to be close. But he also needs to escape when he wants to. Is your Venus square Uranus enough? It’s probably one of the things that drew him to you, but it’s impossible to say if it’s enough long term (without seeing your chart and his chart). Also, his Venus square Saturn means he has some significant fears about being rejected, so he’ll put up walls. All in all, not an easy man to get close to. Yes he is really complicate, and have that walls around himself. Sometimes I see it like he has double rules ( if it is the way to say that in english? )…one for himself, and one for me. And when my Venus square Uranus..do the same… he gets pretty angry on me…and said that I behave like I am not in relationship with him…I do a things on my own. As an Aquarius, I agree with a lot of what’s mentioned here. I’ve always had a strong need for individuation, and being in a romantic relationship has caused me to act differently in that regard than I would on my own. However, I see more of the need for independence in my familial relationships, as they feel much more restrictive than my romantic life. Its been a while since I last commented on here, but things have just gotten better for me, My husband is even more loving then before, I honestly think that Aquarius men get more in tune with intimacy as they get older. Mine is going to be 43 on the 2nd of Feb and everyone who knew him before I was with him all tell me that he was reluctant about being in serious relationships and that was funny for me to hear because when I met him in 2009 he was serious about moving in right away, I waited for about 9 months before I invited him to stay just to make sure that he wasn’t trying to fool me. Today we spend as much time as we can together, he doesn’t have a man cave and I find myself loving him more everyday, after 4 1/2 years the “distance” thing just hasn’t happened yet. Maybe the older the Aquarius man, the more in touch with his feelings he is……When I look at him, I feel like I won the best lottery in the world, I have a man with everything that makes a man desirable.